We received a digital data base giving structural elevation of the top of the Mt. Simon in wells from N. Gupta, Battelle Memorial Institute (digital communication, 1999), and we gridded his point coverage (5-km cells) rather than piecing together structure-contour data. These data could be refined by using numerous high-resolution structure maps on basement and shallower horizons. 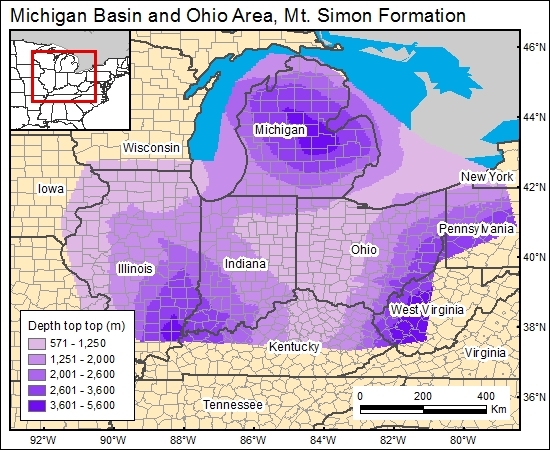 Depth to top formation (c1mtsimon) was calculated by subtracting gridded elevation from a gridded DEM generated from Digital Terrain Elevation Data (National Imagery and Mapping Agency, 2000). Gupta, Neeraj, 1999, Battelle Memorial Institute, Columbus, OH; personal communication.